“(Mayor) Estrada earlier confirmed that he had walked out on a meeting with (VP) Binay after the latter refused a Manila government public-private partnership with SM Development Corp. to rebuild the Central Market into a three-level structure with a grocery on the ground level and roof-deck parking. This is a Php5B development project of SM Development Corp. The differences by all accounts are nothing but how to divvy-up the SOP that could go north by 20%. Erap feels that the malleable legal minds of the Housing Dept will come out with a smooth legal opinion and he gets some advances from the developer. Makati City might have a new Mayor in 2016. Or Binay’s presidential ambition gets derailed for the rerouting of Erap’s support. Erap is hurting because of his son’s Jinggoy’s plunder fix. The Dad wants the eldest son to run in tandem with Binay in 2016. There is some hierarchical protocol in Erap’s family. Jinggoy as eldest and an issue from a legitimate marriage (with Dr. Loi) has the major floor in the Erap household. Binay, with his 6th political sense, wants Jinggoy out of his equation and sounded off for JV instead (ostensibly it was Vilma Santos for now so as not to put chaos in Erap’s compound). Mayor Guia is interested and the Loi Head Office is aghast. 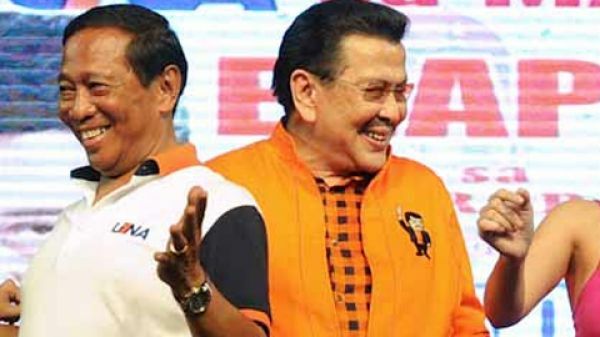 Erap wants a cop-out. Ironically, Erap chose the rehabilitation of a penal institution. Another consensus gelled: harness Mar. “THE camp of Interior and Local Government Secretary Mar Roxas has hired the services of American political strategist Paul Bograd to help him enhance his public image, possibly in time for the May 2016 elections. “Bograd first barged into the Philippine’s political scene when he helped in the presidential campaign of Speaker Ramon Mitra in 1992 and Sen. Joseph Estrada in 1998. It was businessman Manuel Zamora who introduced Bograd to the two politicians. Mar’s handlers want him embroiled in some cause célèbre akin to Vhong Navarro scandal. Why not divest himself with his Korina holdings? Some in the know claim that the engagement of Paul Bograd is a waste of foreign exchange. Does this guy Bograd know the Pinoy psyche in or out? We are a crazy people. We tread on the brink of or into the realm of the bawal. Binay or Duterte is fine specimen. Both know that dynasty is bawal but insist that there is no patakaran. They go about the kalakaran that by deploying a kaanak one is being generous. If you ignore your kaanak, you come close to ignoring your kapitbahay kumpare o kabayan. In effect wala kang pakisama. Erap made clear at the outset that “walang KKK!” and yet he went on his merry ways to flaunt the famous jeep kabit system complete with boundary for each of them para nga naman sa tag-ulan. Remember the New Manila Boracay mansion especially built for the soon-to-be-mayor of Manila, Laarni Enriquez? And a Forbes manor bought by Ramon Ang on instructions from Boss Danding for Mayor Guia? And another New Manila residence for La Aunor, etc.? 60% of Pinoy electorate marvel at these brinkmanship and we forgive our politicians for carving their own monarchies. Our politicians cannot be denied their own Marlboro bounties, err…countries. WE are amused by the legendary courtship of Imelda Romualdez of the Visayas by one Ferdinand Marcos of the vaunted Ilocano electorate fort. This footnote in our political history is proof that the homegrown dictator proved that he has his heart alongside his brain. In fact his cardiologist was at first confounded when the latter could not find the thumping sound on his peritoneum. Instead he detected the sonar search right on his temple. Further tests showed that indeed Marcos has a diaphragm in his cranial bone making space for his pump machine. But Marcos is a medical and historical anomaly. In the case of Mar Roxas, it was his mother who was aghast when one stormy night he bought his Korina at the legendary White House along Edsa for a getting-to-know-you dinner. Ruby Araneta instantly knew that something is awry by the groveling attention of the soon-to-be-bride to their maids. But you don’t dress down a son who is 57 years old in front of the maids? This state of affairs is the knot that otherwise mar a smooth political career. Soon again, the doctors, among other sectors, whom Korina antagonized by the was she espoused the mandatory medical insurance bill on TV, may pass on or leak confidential medical records of the couple. “There goes the 50% of the votes down the drain!”, sighed Ruby. And we are so enamored with political dynasties…..!